With the end of Pre-Service Training (PST) coming up, the last couple weeks have been hectic. My host parents left for a week to visit family in Khovsgol, so I stayed with my two host nephews and my host brother. Peace Corps had instructed my family to teach me how to make a fire and to chop wood so that I would be prepared for ger life. Luckily, my host brother took on the challenge. Aав had already taught me how to make a fire, but the prospect of attempting to chop wood was daunting. My host brother easily picked up the ax, swung with impeccable precision, and chopped the wood straight in half. He then handed me the ax with an expectant look. Having never chopped wood before, I struggled trying to figure out how to hold the ax. Eventually, my host brother showed me one method. I swung the ax… and the piece of wood promptly fell off the chopping block, my ax not having even made a dent. What followed was a series of different techniques for holding the ax, methods of garnering enough momentum to pierce the wood, and a chorus of giggles at each failed attempt from my host nephews. Eventually, I was able to get the ax stuck in the wood. This meant I was on the right track. After a couple more swings, I finally chopped the wood in half! My host brother then eagerly kept placing wood to be chopped since I was now in the swing of things. At the end, when it was clear I finally understood a technique that worked for me, all three of my onlookers shouted бaря хүргэe (congratulations!) and clapped loudly. It was quite the accomplishment. Later that week, with my host parents still MIA, we all went to the river. The scenery was beautiful: a lush river with a ger on the bank surrounded by mountains all around. However, the only aspect that dampened the view, was the trash. All across the ground in various clumps were piles of trash. Considering this was a camp ground and the overall lack of responsibility by most Mongolians regarding trash on the ground, it was not very surprising, but was still quite disheartening. Throughout my time here, I have been constantly saddened by the treatment of the environment. While there seems to be a great respect for nature and animals, there is a disconnect when it comes to trash. Children know not to throw candy wrappers on the floor in the house, yet as soon as they walk outside, they release the wrappers, which either fall sadly to the ground or are taken away by the wind, most likely ending up on the ground or in a river somewhere. Occasionally, entire trash bags or plastic bags from stores are left on the streets, only to be eaten by unsuspecting cows. The smell of burning plastic is a constant in the smaller baghs (towns surrounding aimag centers) as trash pickup is not frequent or even nonexistent. As I would walk from my home to the mountain, I would take a deep breath of fresh air, only to start coughing as I breathed in the burning plastic. The remains of these burned piles of trash can be seen in yards, on mountains, and along riverbanks. This is not to say that Mongolians do not care about the environment, but rather the means of making trash collection simple, which would increase the probability of healthy trash disposal, are not common in Mongolia. In fact, many of the Mongolians whom I have met, are eager to help clean up the environment. In preparation for Нaадaм (Naadam – the three-day summer festival involving archery, wrestling, and horse racing that I mentioned in an earlier post), the entire bagh was painted and rid of all trash. Volunteers went around to the river bank the weekend before and the park two days before the event began, in an effort to beautify the bagh. The other Trainees and I also went with a group of local children the day before the festival to clean up the river banks again. All the children were excited! This group of children had been the group we taught for all our practice teachings. To thank them for attending these, we planned a three-day camp focused on life skills and games. The fourth day consisted of volunteering at the river, an activity chosen by the campers! Throughout the three days, we focused on values, decision-making, and volunteerism. There were also many creative activities during the camp. We had been told that in schools, Mongolian children are typically told what to do and not given the opportunity for critical thinking and creativity. Obviously, this is not always the case, but from our Mongolian trainers, this was common method of teaching in Mongolia. As a result, we Trainees decided to incorporate creative and critical thinking activities. We played the “Human Knot” game (pretty common in the US), made dough figures which were painted the next day, and taught the children what a relay race is by holding a water relay (my team won!)! The camp was a success and a great opportunity to get to know all the children on a deeper level than in class. By the end, we were so familiar with the kids that during Нaадaм when we saw many of the children at the stadium or the nightly concerts, we always stopped to talk! Now onto Нaадaм. The entire summer, we had heard about Нaадaм as the climax of the summer. All the other training sites had already had their local Нaадaмs, but our site had moved Нaадaм later to have it coincide with the soum’s 80th year anniversary of foundation. In preparation, we all bought дээлs (deels – traditional Mongolian outfits) to wear. My host father unfortunately was not a huge fan of Нaадaм, so my family did not attend. Luckily, they had invited their PCV from last year to visit. I was able to go with him to Нaадaм and saw many of the Trainees from the other training sites in our region, as this was a huge event. We watched the wrestling, the end of the horse racing, and the beginning of the archery competition; some Trainees even tried нум cум (noum soum – bow and arrow). The main attraction though for the Americans, was the appearance of new delicious foods: Mongolia’s version of hamburgers, real ice cream, iced fruit drinks, etc. We also walked around to various stalls. This is where I bought my cool new hat for about half the price it typically is in the soum. Overall, Нaадaм was a great cultural experience with new American friends from the summer! After the excitement of Нaадaм was over, it was basically a straight-shoot to the end of PST. There were some ups and downs. A couple downs: I tried to get my hair cut in layers (layers are an entirely foreign concept in Mongolia) so my hair looks like it has two different lengths, my host nephews left, and I got sick for the first time (this included diarrhea, vomiting, and fainting). Luckily, I survived both ordeals. A couple ups: completion of the Language Proficiency Interview (LPI – a conversation testing at what language level we are in which TEFL Trainees are expected to reach Novice High and Health Trainees are expected to reach Intermediate Low, which I met woot woot! ), making a shagal (traditional Mongolian ankle bones game… I thought the pieces were bought and didn’t realize that each family makes their own by breaking of parts of the sheep or goat’s leg bone and eventually flicking off the ankle bone; my host parents were extremely proud of me for completing this process), and Host Family Appreciation Day. We held a lunch for our families. The Trainees made tacos; there were some spices in the taco meat which we hardly tasted, but our family members, used to relatively simply spiced foods, thought the meat was almost too hot and spicy. Some other Trainees’ parents could not eat the meat as a result, but my parents were strong and braved the spices! Last night, my host parents and I went to a new mountain and had a photo shoot as our last special evening. We watched the sunset and then played pool at my host father’s work. This morning, the other Trainees at my site and I woke up to watch the sun rise. Of course, Ask came with us for one last hurrah! The sunrise was beautiful; although we should have listened to one of the host fathers about from which mountain to watch the sunrise, but the experience was a nice way to end PST. I’ve just finished packing all my belongings extremely heinously into my various suitcases. I’m sure my clothes will be wrinkled when I get to Final Center Day with all the other Trainees and Peace Corps Staff. Tomorrow we leave our training site to go to a larger city where we will find out our permanent sites, and two days later we will meet our supervisors for the first time! The start of actual service is about to begin! Since I got a sim card and data, I’ve been able to keep up my Snapchat streaks (woohoo!). It’s been a new realization finding out how quickly you actually go through data without Wi-Fi consistently present in your daily life. It’s entirely possible to go through 2 GB in 2 days using only Snapchat and Instagram. I haven’t found Wi-Fi anywhere here, so I keep my phone on airplane mode. The problem arises when my new host nephews decide they want data and try to get me to turn my phone off airplane mode. The two boys spend hours playing random games. The most amusing so far has been a version of Flappy Bird where you have to sing loudly or quietly to move the bird up or down respectively. Most weekends when I wake up and step out of my room, the boys are immediately all over me and want to play cards. Sometimes during lunch breaks on days I have class, we have dance parties! They’ve also been really helpful with learning new children’s games. Since they came from Ulaanbaatar (UB) to spend the summer with their grandparents, all the neighborhood kids have been constantly in and out of our house (my host nephews are minor celebrities in the soum). I’ve learned a couple games: cops and robbers, wolves and kangaroos, a Mongolian version of 4 square, and a game called “төмс” (potato) where the kids stand in a circle and whoever drops the ball has to go crouch in the middle of the circle and can be hit by the ball by someone from the circle. These games were particularly useful when we went to camp for three days as the campers played the same games. All the Health Trainees woke up early on a Saturday to catch the 7 am train headed towards UB. We were on the train for 7 hours before arriving at a new province we’d never visited. At the camp, there were about 40 kids who had extremely busy camp schedules. Starting from morning exercise at 8 am, the kids went on hikes, practiced for the talent/fashion show, etc., and ended with dance lessons and a disco at 10 pm. We were lucky that we got to teach them practice lessons on nutrition and exercise. Fortunately, we’d already had some practice before at our training site. About 20 kids from our soum participated in our first practice teaching. I knew 4 students in the class! My partner and I taught a lesson using Peace Corps’ pre-planned health lessons on nutrition. These lessons act as guidelines that can be adjusted to meet the needs of the class, so we basically redesigned the entire lesson and made new handouts as well. Since then, we have taught another lesson with new partners on alcohol and tobacco prevention. In the coming weeks, we will be teaching life skills lessons and planning a three-day camp for the soum kids! A couple busy weeks ahead! Today I was talking with my family in the States, as we do every Sunday, when I told my mom I don’t really want to buy a separate Sim Card for my phone if I can’t have Wi-Fi as well. Since my mom is a brilliant human being, she reminded me that we’d packed a nifty little gadget that utilizes a Sim Card to create Wi-Fi! After this realization and a conversation with my host father who then pointed to my host brother (recently returned from college), I learned two things: tomorrow I can buy a Sim Card (yay Internet!) and my host brother speaks English…? Besides this exciting news, a lot happened this week. On Thursday, I received my first package from the United States. My parents had informed me during our last call that it had arrived at Peace Corps Headquarters. It took 8 days to reach Mongolia (4 of those days were spent in Chicago) and then a week before Peace Corps officials brought it to my site. This was just a test trial, so only a few things, like sports bras, were sent from home, but it was still exciting. I’ll be receiving a new package filled with important goods and snacks from my mom! Two nights ago, my host parents surprised me with a meal prepared just for my liking. When I learned how to say what I like and dislike in language classes, I decided to practice on my host parents; I mentioned that I love pork, just as a random fact to practice Mongolian. Then, this Thursday when we were eating tsuivan, I said that I like potatoes (in Mongolian meals that don’t utilize the plethora of spices Hungarian food does, the potatoes have the most flavor as they soak up the few flavors within the food itself). After going to the market, where I indulged myself and bought two nectarines and one orange, my host father proudly pointed out that they’d bought pork. I didn’t think much of it until he said “thank you………” in English in a sassy demeanor. At that point I realized the pork was bought for me, so that night for dinner, I had an extremely delicious meal consisting entirely of pork and potatoes. My host family is definitely the best! They also took me on a couple trips this week. We went up to the Russian border on Monday. I had heard from previous PCVs that sometimes your host family kidnaps you on day trips during PST, and you have no idea what’s happening. Well, this turned out to be one of those times. I thought we’d go to the market like we usually do, but my host father kept going past the market and continued onto the highway. Luckily, the music selection was dope. Besides listening to an assortment of Russian, Mongolian, random Spanish, and Backstreet Boys songs, we also listened to Ace of Base, which ironically is a band my dad and I enjoy in the States (I guess this band transcends cultures with fathers). As we were driving, my host father pointed to the sign on the side of the road that said Russia. Apparently, we were going towards Russia. We ended up at the last soum (small town) right before the border. When we arrived, I called the PST Duty Office to inform them I had left my training site. We ate dinner at a khuushuur restaurant that was somehow owned by a member of my host father’s extended family (I didn’t really understand their explanation) and walked around. That’s about the closest I’ve been to Russia! I also tried some new food at the restaurant. I’m not sure what it was, but it’s made up of some sort of cow’s milk product that gets mixed with a type of nutty flour used to make dough. The result is a slightly sweet paste. On our way back from fishing at the river, a couple extra people piled into the backseat. Turned out they were our neighbors. I was excited to get home since the mosquitoes were coming out at the river and because I had planned to go hiking with another Trainee. Little did I know that although we were right next to our home, we were not finished with our trip. As we drove by our house, I called my friend to inform him I would apparently not be able to go on the hike. We ended up driving to greenhouses out in the valley, where my host father helped set up the irrigation system and my host mother chatted with other Mongolians. Luckily, the rest of the week I got to go on some beautiful hikes on the surrounding mountains. This week I haven’t really been running as much, partly because my knees mildly hurt (I think from using the outhouse or from running) and because there was slight drama with the neighborhood children. This week in class, we learned how to talk about our families, our age, and our phone numbers. The day I learned how to say my phone number, two of the neighborhood children happened to ask for it. Excited as I was about my newfound ease with phone numbers in Mongolian, I happily rattled off my number. Now we had been told during orientation by Peace Corps officials to be careful about to whom we give our numbers. I thought this meant random people and acquaintances; little did I know that this also extended to basically anyone in our direct community. That night, I came home and told my host parents I knew how to say my phone number. Right off the bat, they warned me not to give it to anyone but them. This brought up a slight communication conundrum as I had to inform them I’d already given it out. They proceeded to tell me not to answer any of the calls I would receive. Now, I had also been warned by PCVs that Mongolians tend to call multiple times a day even if the calls go unanswered. I was unprepared for the onslaught of so many calls. Every three hours, one of the three numbers would call my phone (apparently, my phone number had been passed around). This wasn’t annoying as some PCVs had made it sound, but I didn’t want to get into a sticky situation on a run where the kids would ask why I don’t respond to their calls. In reality, it was also nice to spend time with other Americans on these hikes after straight integration for the last week and a half into the community. Don’t worry though, I’m back to having my curls boinged by little girls and playing various children’s games (many of them were also played in the US during my childhood so I’m prettttyyyy good at them if I do say so myself). The calls stopped after a day and a half, which was a relief, so now my phone is reserved for calling other Trainees (yay for other Americans)! I’m excited to go take a tumpun bath, and I’m hoping my host father finishes fixing the outdoor shower soon! Can’t wait to see what this week brings with the introduction of Wi-Fi to my life! Along the way, we saw many reindeer, camel, and horse statues (three of the five native herding animals of Mongolia). There were also many animal corpses and skeletons on the side of the road. I’m used to seeing roadkill on US highways, but I’ve never actually seen the remains. Luckily, seeing the horses and foals on the side of the road was more attention-drawing than the skeletons. At the gas stations, I bought some candies for my host family to give as a present along with perfume I’d brought from the US. I spent about 6,000 tugriks total, which is more than a day’s worth of money. We’re each allotted 4,000 tugriks per day, which comes out to 132,000 tugriks per month. As a reference, a 70-pack of baby wipes (which was recommended by current volunteers as a substitute for daily bathing) is about 1,900 tugriks. My training site is in the north of Mongolia, about 20 kilometers from the Russian border. We were warned by Peace Corps officials to avoid accidentally going on a run and ending up in Russia (more to come military later). When we arrived at the school where our language and technical classes are, we were met by our host families. They each presented us with a bowl of milk and a haddag (traditional Mongolian textile that looks like a scarf but is used more as a respectful ritual). Afterwards, we took all our bags to our families’ homes. Luckily, Peace Corps kept our winter bags, but to make sure we still had a lot to carry, we were given heavy-duty sleeping bags and large water filters. Once we drove home, I noticed about five girls of various ages staring at me and giggling excitedly at the sight of me. When I waved to them, they squealed and quickly dispersed. I was then taken to my room. It’s quite small, but it was nice to be able to finally unpack! That evening I was fed a bunch of food, which ended up tasting much better than the westernized Mongolian food we were served at the hotel. My host mother brought out her huge photo album, and then I showed my small photo albums (one that I had put together, and two that my amazing sister gave me as a going-away present). After that we ate more and went to bed. I was worried the family would have plans, so I wanted to know when to be ready. Luckily, Peace Corps had provided a handy-dandy phrasebook. Just because Peace Corps wanted to help with my integration into the Mongolian language, they were kind enough to not include the phrase “when should I be ready/wake up tomorrow?” (yay for integration!). Luckily, the family let me sleep in, so all was good. The next day was Sunday, so after I woke up around 9 am, I ate breakfast with the family. Then my host father called his host Trainee from last year. I was able to talk to him about the confusion with the water filter (the first use should be disposed, but I felt bad wasting all the water my host father had put in it) and ask about where to bathe/shower. After this helpful talk, I was taken to the store where my family bought a 5-liter canister of water (so apparently, they’re still slightly confused as packaged water is safe to drink for foreigners) and then to a shower house! I had a nice shower with hot water, which I should have valued much more at the time… That afternoon, I met some of the neighborhood children, who are extremely fun and excited to meet a new American! Then, I ate dinner and went to bed. Each night I fall asleep to a chorus of cows, goats, and dogs which all start making their respective sounds as soon as sunset begins. The week started with language lessons. We have two Language and Culture Facilitators (LCFs) who are native Mongolians. One is a Russian and English teacher, while the other is a Mongolian language teacher who has worked with the Peace Corps the last 8 years and doesn’t speak English. These lessons go from 9 am – 1 pm with one 10-minute break and one 30-minute break. Afterwards we have lunch from 1 pm – 2:30 pm for which we go home. I’m usually served soup for lunch, and sometimes for breakfast as well. Then in the afternoon, we have technical training, which for Public Health volunteers means learning about the healthcare system, health education in Mongolia, and common health problems found in Mongolian youth. We’ve had a panel with teachers at the school and even visited the adolescent ward of the local hospital, as well as the HIV/Aids and STI clinic. Apparently, gonorrhea and syphilis are the most common STIs in Mongolian youth. The youngest case at this clinic was a 14-year-old girl. Once a week, we have the regional meetings, which will typically be on Wednesdays for my region except when the Health Trainees are away practicing teaching at summer camps (woot woot something to look forward to throughout training!). The regional meetings are further nutritional and safety sessions. At this first regional meeting, we got another vaccination. There have been so many, I honestly don’t remember what the last shot was. But the nurse who administered the shot said she remembered me. To quote her: “Ah yes, you’re the one who always sings” (that’s a nice way of saying I squeal loudly when I get shots). Me: Spoon, spoon, spoon, spoon, bread! You get the picture… Now that I’ve been in the community for a week, I can say short phrases, like “it’s hot” and “I slept well”. The language lessons help with grammar and understanding how the language works. We also practice pronunciation, but most of my practice comes from speaking with family and community members. Each day there’s a different topic. The first day was food; then I learned about the sunset, flowers, trees, rainbows, sunrise, and the train. I’ve also learned the five animals of Mongolia (horse, sheep, goat, camel, and cow) in Mongolian, in addition to “pig,” “dog,” and all the baby versions of the respective animals. When we hiked to a temple (I’m never informed of these trips so I don’t bring my phone to take pictures), I learned “step,” “tile,” “chair,” “trashcan,” and “mountain”. I’ve also learned cooking phrases such as “to cut meat” and “to knead dough”. One time, my host mother asked me to cut the meat. This ended up in her having to re-cut the meat since I cut the pieces too large as my host father doesn’t have all his teeth and requires small pieces of meat. In addition, I’ve learned “fire,” “matches,” “wood,” “river,” “boat,” “house,” and “ger” (now don’t worry, I’m not a pyromaniac, I was just learning how to make a fire to cook tsuivan and buuz). My host father also enjoys teaching me comparison words: long vs. short, hard vs. soft, big vs. little, tall vs. short, thick vs. thin, wide vs. narrow, etc. This past week, the head of Safety & Security stopped by all the houses at my site. I happened to be at home when he was at my house since we’d gotten out of class early. He translated for my host father, saying that apparently, my host father is very impressed with my ability to learn new words and remember them. My host father was pointing at different objects and asking me to identify them in Mongolia. He even showed off my phrases, like “hot water with honey”. This one is slightly difficult since “with” is a case. Mongolian is an agglutinative case language so the suffix meaning “with” gets added on to the end of the word that was added. In this case, I say “honey-with hot water” which means that the hot water has honey added to it. Luckily for me, this is similar to Hungarian. It’s been interesting learning in class about cases, as Mongolian also has cases that mean “to” and “from” and are also added as suffixes. In addition, if you say “I like apples” in Mongolian, an “nd” sound is added to the end of “apple” to identify it as a noun on which the verb is acting (i.e. “I apple-nd like”). This has been slightly difficult for some other Trainees in my class to understand since English isn’t really like this. I’ve also talked with some of the TEFL (the English teacher Trainees) about their language lessons. 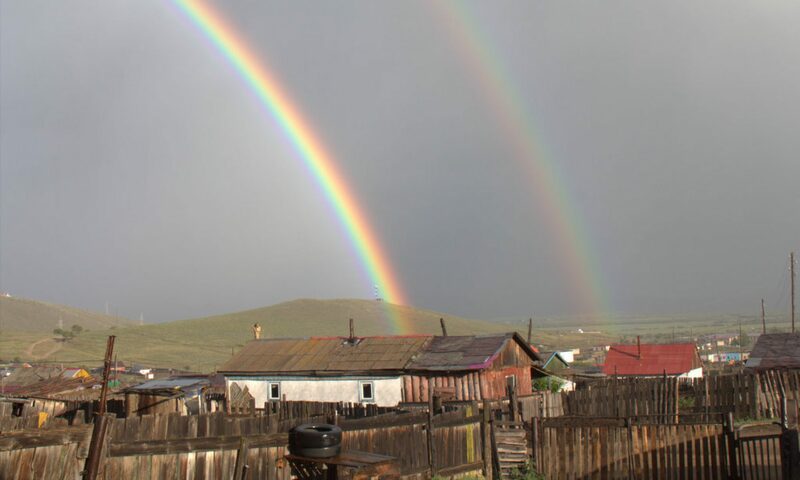 The TEFL Trainees must reach Novice-high by the end of Pre-Service Training (PST); however, since Health Trainees will be ideally teaching in Mongolian, we must be at Intermediate-Mid. As a result, the Health Trainees are in smaller sub-groups for language lessons. This first week, each training site was in one group for language lessons, but on Friday, each site was split into sub-groups of 4-5 for TEFL and 3 Trainees per group for Health. We split into a fast- and normal-paced group that we self-selected at my site. I’m in the fast group with two similar-aged Trainees. It’s definitely been helpful that I’m still in “school-mode” while other Trainees at my site haven’t been in school for over a decade. Besides the language, integration into the community has also been its own experience. There was one day when I ate so many buuz, I felt like I really needed to work out (supposedly the PST 15 is real). I asked my host mother if I could run up the hill we hiked the day before, but she mimed that the dogs would bite me. Luckily, our dog, Ask, is very nice (although he’s not the brightest). He loves trying to untie my shoelaces, even when I wear sandals… My host mother said that I could run on the streets. Then, out of nowhere, a roughly 11-year-old boy showed up right in front of me. Apparently, he was requested by my host parents to be my running buddy for the day. He was paid in candy. Little did I know that besides having a regular running buddy, I would also become Batman’s sidekick (he calls me “Robin” since “Roberta” is too difficult without regular practice!!). Yet, the next day, his friend showed up at lunch and mimed running and said “7 pm”. I rightly assumed that I would be going running again that day as well. Now, I typically don’t run in the US, but it’s the only easily accessible form of exercise here. However, apparently, I am now an avid runner. I run each day at 7 pm… What started out as me with a single running mate, has now become a small group. I now run with three teenage boys. Each day a new neighborhood child joins. Typically, at the start of the run, a small crowd gathers of kids who want to run but haven’t yet garnered up the courage to ask, so they just excitedly watch and wave. As we were finishing the run yesterday, an approximately 7-year-old girl ran up and asked if she could run with us tomorrow. So we’ll see if she joins us today! My first running mate typically rides a bike now that others run with me (he doesn’t really like running). After our runs, we always play volleyball. I stopped counting one night after 17 Mongolians joined in on the fun and a small group of three- to five-year-olds started playing badminton next to the volleyball circle. On our run yesterday, we saw the military truck coming in from the Russian border, so we all took off at a sprint (see I told you there’d be more). I’ve had more than enough interaction with the military. On a run with my original running buddy, the military truck driving by pulled us over. Well, more like pulled me over, but as my site-mates like to say, my “11-year-old bodyguard” was there to explain my predicament. I was asked where I am from and warned to stay away from the Russian border (like I could even run 20 kilometers there and 20 back…) Luckily, everything worked out, but now I always run with a copy of my passport. The only slightly challenging part of life in Mongolia has been showering/bathing. Besides the hot shower I had the first Sunday, I have only had one tumpun bath. A tumpun is what Mongolians call a plastic bin. First my host mother washes my hair, scrubbing my scalp raw, and then she leaves the kitchen so I can use my tumpun for the important body parts. It’s slightly better than baby wipes. Honestly, the bathing part isn’t that rough (even considering that I run every day… the wind helps a lot with cooling down and drying clothes); what’s difficult is feeling that my hair is greasy. I can feel it in my scalp. If I could get down a system of washing my hair three times a week, that would be great (but it would also be wasting water, since the water left after the hair washing is used for the rest of the body). On the topic of water, yesterday (Saturday) I helped fetch water from the well. Apparently, Saturday is the day of work and chores in Mongolia. My host father fixed the floor boards in the house’s entryway and added a cardboard/linoleum layer, while my host mother gave the dishes their weekly intense cleaning (unfortunately cleaning dishes after every meal isn’t really a thing in Mongolia… rather they receive a quick rinse in the same water that’s been used all day for dish rinsing… I try not to watch). I woke up a couple hours later than my host family and, after eating breakfast, immediately went with my host father and a neighborhood boy to fetch water. I pushed three canisters in the makeshift wheelbarrow. Fortunately, the full canisters only need to be pushed downhill (yay for gravity and potential energy… see, you do use physics in your everyday life). The water ran out at the well, so while we waited for a truck to bring more water, I started on my laundry. I used my tumpun again, this time as a basin. My host mother put Tide in the water, and then I used Tide with a bar of laundry soap to clean my whites. The water was then dumped and filled with clean water used to rinse out the soap. I hung up all my clean clothes and then started on my thicker clothes, like business casual blouses, dresses, pants, and sweaters. The hot sun and the wind meant that within 3 hours, all my clothes were dry, even my thickest sweater. Since Mongolia doesn’t like to leave me time to rest, the water arrived as soon as I was done with laundry, so I went on three more runs. It’s a blessing that my host father has a car because this way we were able to drive the next runs instead of using the wheel barrow. I’m sure in the future, I will have more physically challenging chores, but for now I’m pleased that fetching water was my only duty. To date, Mongolia has been a pretty amazing experience. Plus, the scenery is beautiful (I have some wonderful photos). I’m excited to see what the rest of PST brings and to get back to having Wi-Fi so my posts can be more frequent and much shorter (I was too excited to share all I learned)!